Video Image Master Pro is a video converting application specifically designed for the needs of image productions from video, or video productions from image and audio. Converting is simple and, better yet, the high performance video engine is beyond fast. 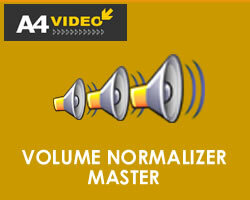 Volume Normalizer Master is an intuitive application, designed to help you modify the volume of various types of video and audio files, singularly or collectively. This software normalizes audio or video files by peak volume detection and RMS volume detection. Videos recorded by mobile devices have a hotchpotch of different video formats and orientations, it's difficult to view and edit on computer. This Tool can help you overcome these problems.